Full disclosure: I am not an interior designer nor an aspiring interior designer. I do love to solve problems, make design plans in keynote and decorate. Back in July I shared the news that we had moved into a new house, see here & here. Now six months later, wowee, I wanted to share some updates on life in this new house specifically choices we have made on the interiors and share some sources as I have gotten lots of questions on where we sourced everything. First the look & feel. It took a while to determine the aesthetic. The house is a 1925 dutch colonial so it is traditional and unfussy. We don’t have any of the charm that we had in our old house, I still miss the wood paneled dining room with built in china cabinet/buffet. We no longer have the crown moulding and living room built ins flanking the fire place. But what it lacks in character it makes up for in a really livable floor plan & being the opposite of rough around the edges. Because we were lacking personality in the house I knew we could bring that with our decor choices. 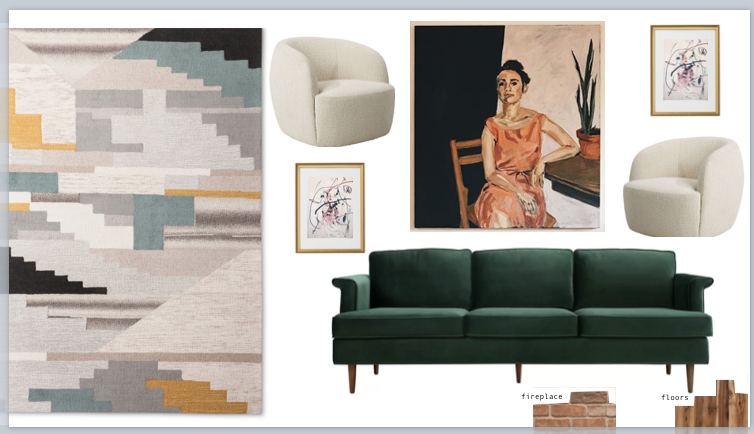 After a few weeks, maybe a couple months, I landed on an inspiration board for the living room. What ultimately came together as a mix of colors and textures then transitioned into the below mock ups of the space. As you can tell the portrait, no not of me, was a key piece for the space so I mocked everything with that to see how colors could work together. 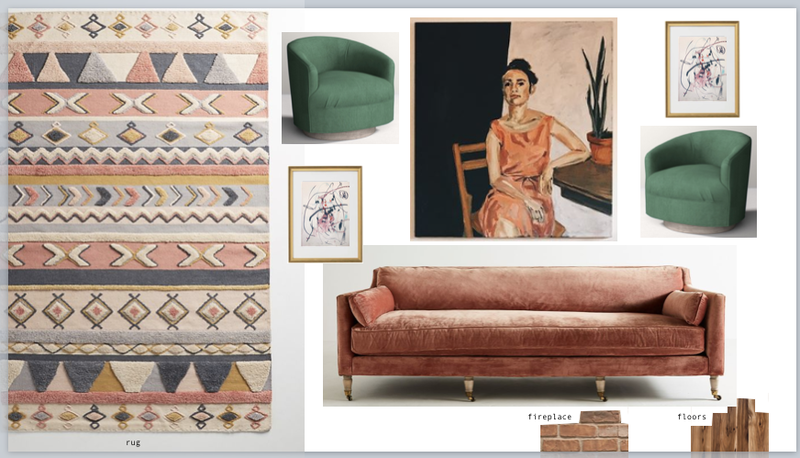 As I pulled these inspiration rooms together I found a couch I could not pass up. The nine foot yellow velvet guy that you have seen on instagram and sits in our living room now. That was the first purchase we made. It was special, unique and had some soul. I really wanted as much of the room to be used/vintage to add personality to the otherwise simple space. I found the couch via instagram at my current favorite vintage shop in Portland, Midnight Sunlight in SE Portland. It is dangerously close to our house. I went over after work one day with Momo and tested it out. It was so fun and hard to say no too. Fortunately Mike was on board too. I have developed a little friendship with shop owner Sunny and text her often with design questions and furniture advice. Cannot reco this shop enough. The selection is top notch and pricing is fair. From there everything else came together. I had the timeline of Thanksgiving looming over me and felt urgency to pull the room together as we would be having lots of visitors. It is probably not as ‘designed’ as we had intended it to be nor is it really complete quite yet. But it is 100% livable and very us. Below are some snaps of key elements of the room in our everyday lives. This here is mid October when we just had the couch and rug and the room was feeling lonely without some furniture buddies. Below a better shot of the couch and rug as well as a typical Saturday morning with Momo. The rug was a find on Anthropologie, I found it on sale and it looks like it still is. I highly recommend checking out their selection, some really unique and beautiful finds. As for additional seating in the living room, Mike and I agreed that swivel chairs would be super fun. We have plans to eventually replace the window that looks into the backyard with glass doors to a deck and the yard so swivel chairs proved a nice way to allow you to have conversation in the living room and turn to take in the nature of the backyard. I landed on these fun ones, the Augustine Swivel Chair from France & Son via Burke Decor who actually had a much better price. I got them for 25% off what they were on their original site. These chairs bring a bit of balance to an otherwise feminine space. The rug is super femme and I like the contrast/split personality of the space. It is unexpected but we think it works. The wall where the chairs are now has a gallery wall that I did the night we got back from Japan. It was not a super thoughtful exercise nor is it permanent, see above re: glass door plans, but it definitely works. The mantle is a work in progress and is now home to a collection of frames/art from our old house. I needed something there. Open to any ideas. Tried a mirror initially but wasn’t sure if the room needed that. Send tips! To round out the essentials in the room I got a vintage brass and glass coffee table and repurposed our old living room credenza in the new space and it sits below the really large front window. I don’t have photos of these two things but they are featured on IG stories most nights when I document the randomness of our life. The room got finalized with two large plants. I was 100% anti the ubiquitous fig trees that you see in nearly every house and wanted something with height. We landed on a lemon tree and a lime tree. Which are both looking quite promising in their bearing of fruit! Kaya rug from Anthro, Augustine Swivel chairs from France & Son, couch from Midnight Sunlight shop in Portland, coffee table from Hawthorne Vintage Modern in Portland. As of Friday this room is extra busy with the addition of a Christmas tree. Hope you enjoyed this little round up.